In order to achieve high throughput today, industrial measuring technology and microscopy, optical inspection tasks, and laser processing need positioning systems that are as fast as possible and offer high travel accuracy and stability. 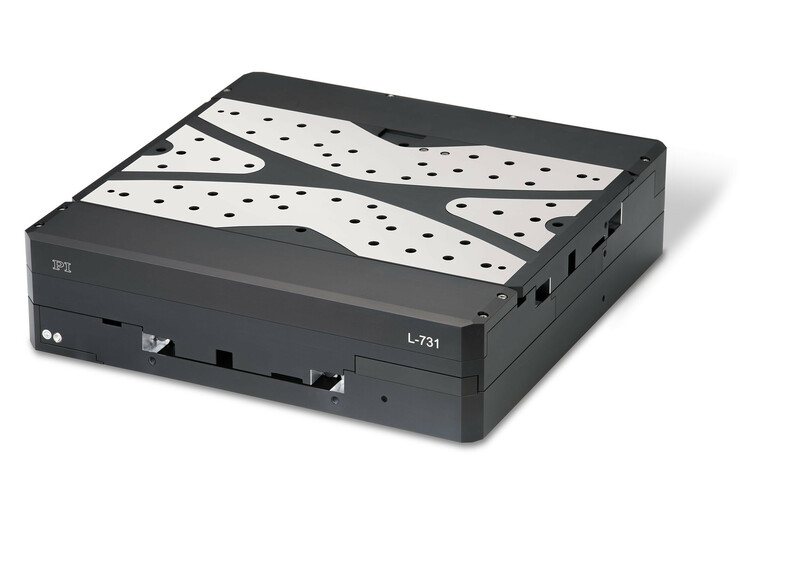 For these application fields, PI (Physik Instrumente) now offers a new series of different motorized XY stages (V-731 and L-731) that work with velocities up to 200 mm/s. The bidirectional repeatability is 0.1 µm and minimum incremental motion is 0.02 µm. The XY stages, which have a size of only 310 × 310 × 80 mm, are offered with travel ranges of 205 × 205 mm (8 inches) and it is also possible to offer customized versions. They are controlled by PI controllers or – in multi-axis gantry applications – via an industrial controller from ASC, a worldwide leading manufacturer of modular motion controllers, who was taken over by PI at the beginning of 2017. Either linear drives (V-731) or stepper respectively DC motors (L-731) are the driving force behind the new XY stages. The three-phase linear motors dispense with mechanical components in the drivetrain and transfer the drive force directly to the motion platform without any friction. This means that velocities OG up to 200 mm/s are possible. The ironless motors are particularly suitable for positioning tasks with the highest demands on precision because there is no undesirable interaction with the permanent magnets. This allows smooth running even at the lowest velocities and at the same time, there is no vibration at high velocities. The L-731 XY stage works with velocities to 80 mm/s. It is possible to use either stepper or DC motor-spindle drives. The two-phase stepper motors also generate a high torque at lower velocities; the DC motor variants are recommended for applications that require high running smoothness at high forces.